Corgan was quoted as saying, that after the success of “Melon Collie And The Infinite Sadness” D’arcy began an “apparent slow descent into insanity and/or drugs (take your pick).” In January of 2000, shortly after leaving the band D’Arcy was arrested in Chicago after she purchased three bags of crack cocaine. 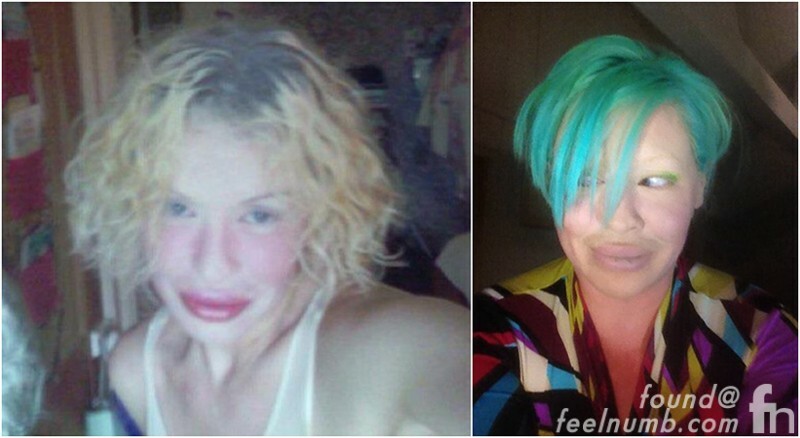 Her look also drastically changed during this time. 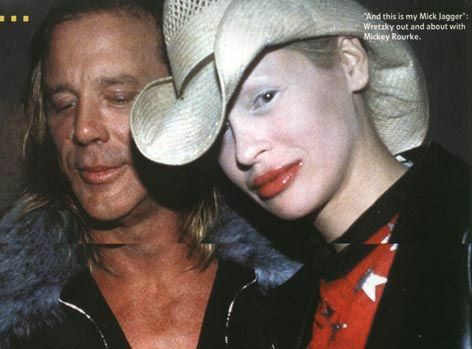 Here she is a few months after her arrest with Mickey Rourke with whom she had a part in the movie “Peaces Of Ronnie“. She has remained almost entirely out of the public eye since 2001 until recently, when she was arrested and jailed for six days in Michigan on charges of bench warrants for “animals running at large” and a separate drunk driving charge. Apparently, D’arcy was cited in 2009 after some of her horses broke out of her farm and ran through town. She was cited by Animal Control but never paid the fine and missed subsequent court dates on four occasions. Then, on Tuesday February 8, 2011, D’arcy crashed her car into a retaining wall at 3:20 AM. Police said Wretzky, who was not injured in the crash, was arrested on a charge of drunken driving and several bench warrants out of Berrien County. Hopefully D’arcy gets it together soon. UPDATE: Wretzky has been active on Facebook recently and has put up a few selfies in which she looks much much better. Glad to see she is doing well. You say "she has remained almost entirely out of the public eye since 2001," but you neglected to mention her resurfacing in July 2009 (about 4-5 months after the noted citation that started all this) by calling in unexpectedly on Chicago's Q101 FM and making some coherent and semi coherent statements about a variety of topics. Nice post in any case.